For the very important job of being a Bridesmaid a special little gift is often a lovely way to say ‘thank you’. Decorate your gift or card with our lovely tags and ornaments or, as jewellery is a popular gift, place the gift itself into a personalised box. 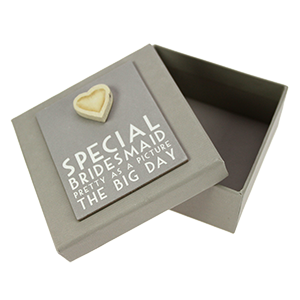 Give your Bridesmaid/s a lasting memento like an album or keepsake box or keep it simple with a carefully chosen little present given with lots of love and thanks. 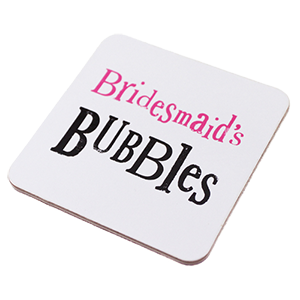 We have beautiful bridesmaids cards so you can ask your friend or family member 'Will you be my Bridesmaid?' and then, afterwards say 'Thank you for being a very special Bridesmaid' too! If you'd like to theme a gift for your bridesmaid we have lovely bridesmaid 'planners, (to help them be even more amazing!) and sweet tags and keepsake boxes for all the mementos and memories from the wedding. It's so thoughtful to give a special gift that will remind your bridesmaid of when they supported and looked after you and was such a key part of your special day.